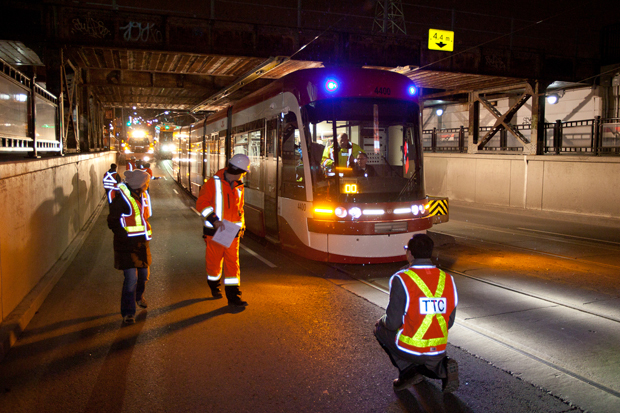 The first of Toronto's new streetcars has begun late night testing. On the night of March 13 to 14 the car made a nocturnal journey from the Hillcrest shops to Bathurst Station, a route that tested operation around curves, up and down grades, and passing under a bridge. The car is the first of three demonstrators called for in the contract with Bombardier. Once testing is complete with these three cars, series production will begin. TTC plans to begin using the cars on Spadina in early 2014, then to convert other lines one at a time. The last of the older cars would be removed from service by 2019.